Baylor Scott & White Health physicians will have access to the EHR data stream to offer better insights into the cost and impact of their orders. Texas Hospital Association announced that it is now using Smart Ribbon analytics technology to show physicians actionable clinical and financial data atop their electronic health system. Baylor Scott & White Health, in fact, has already deployed THA Smart Ribbon, which was created by IllumiCare and the Texas Hospital Association’s Center for Technology Innovation. 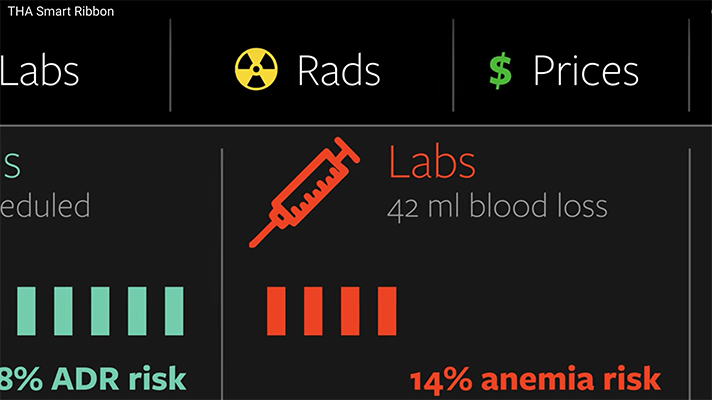 THA Smart Ribbon is designed to help physicians be more informed about the cost and clinical necessity of the tests they order. Studies have shown that the more docs know about the price tag and impact of specific tests when they're at the point of care, the more likely they are to order fewer or less costly procedures and medications. Smart Ribbon uses a patent-pending, EHR-agnostic technology that taps HL7 feeds to gather clinical data and leverages existing authentication and permission infrastructures. IllumiCare says the tool can show physicians real-time cost and risk data, including detailed information about medications, labs and radiology. At Baylor Scott & White, doctors will be shown data at the point of care with a "ribbon" of information, according to THA, that can help them better evaluate the need for previously performed tests – X-rays, EKGs, labs – and help them determine the necessity of the test, cost to the patient and health system and impact on the individual’s health. Physician ordering can affect more than 85 percent of hospital costs, studies have shown, so the Smart Ribbon data, which "hovers" over the EHR at the point of care, can help docs think more strategically about the tests they call up. Stephen Sibbitt, MD, Chief Medical Officer at Scott & White Medical Center–Temple, said Smart Ribbon is first being deployed at that system first. "The benefit of an integrated delivery system with our electronic medical record has allowed us to reduce unnecessary testing and care, which ultimately benefits the patients and lowers healthcare costs overall,” Sibbitt said.